﻿ How to Create Effective Event Marketing Emails » Red Mango Marketing! Hosting an event is never easy and always equal parts excitement and exhaustion. There’s a lot of planning that goes into hosting a successful event. Event marketing is a great way to promote your business, get more leads, share insightful information, meet people who matter and generate a buzz around your business. Be it an online event or an offline one, what really matters is that people show up because you compelled them to. It all starts with the event marketing emails that you send out. Create a plan. How many emails will you send? What will these emails say? How can people reply or register for the event? Email marketing is the most effective and common method used by marketers to promote an event. While 40% of the businesses have started using social media to promote events, email marketing stands at 76% in terms of the most commonly used event promotional strategy. One cannot deny that emails continue to be the best and most effective way for businesses to connect with their customers and potential leads. Be it a a promotional email or a non-promotional one, an email helps you stay top of the mind and gets your message through. Event marketing is not something new, but event marketing emails is definitely a space that businesses are still exploring. In fact, a recent report states that almost 40% of event marketers believe that emails are the best way to promote an event. Who are you sending the event marketing emails to? Unless you know who your audience is, the right message will never be delivered. Knowing who you are sending the emails to effects what you say, how you say it, and how well it will resonate with the reader. For example, if you are sending event marketing emails to prospective leads you may want to give a small introduction about yourself, whereas your existing customers don’t need that. If required, draft two separate emails and segment your email list accordingly. Event marketing emails can be as simple as ‘Come Attend Our Event’ or something exciting like, ‘Don’t Miss Out On The Most Exciting Event in Town’. But what you say depends on who you are and who your audience is. The event marketing emails you send have to resonate with your business and how people perceive it. You can be simple, direct, funny, and even over-the-top. What emotions are you trying to play on? When we read something we feel a certain way. In the same way, your event marketing emails will make your readers feel. What emotion do you want that to be? Do you want to make your readers feel excited, intrigued or compelled? What do you want the readers to do? Sending event marketing emails is not enough, making sure the readers take the desired action is the key to a successful event. Do you want the readers to click on a ‘Register Here’ call-to-action, or do you want them to get in touch with you via email, phone, or RSVP? Adding a link to an event registration form is the best way to keep count of attendees, track email marketing metrics and also know if the emails are working. After you’ve spent a considerable amount of time thinking and brainstorming the above-mentioned questions, it’s time to start chalking out your email marketing strategy. Depending on the scale of the event, type of event and the number of people you are inviting, you need to chalk out how many event marketing emails you are going to send. This includes the first email that goes to all, follow up emails, reminder emails, emails to people who may have not opened the email at all, and more. The key here is that each email needs to be drafted and well thought out. You cannot have the exact same reminder email or confirmation email going out every time. The effectiveness of any email campaign, including event marketing emails, greatly depends on the subject line. You have just a few seconds to make an impression in an overly cramped inbox, so make sure your email subject line stands out and grabs attention. You may have a lot to say and many reasons to give as to why an email recipient must attend your event, but keep it short, to-the-point, and crisp. No one likes to read long emails, and the idea is to get the reader to register quickly. Pick up the key highlights and the most valuable parts of the event to lead the person to the call-to-action. This is a very important point to consider. Sometimes even the most compelling content and call-to-action can get lost around an overwhelming design. Too loud, too many fonts, too many or little images, cramped up content, too many colors are just some elements of a bad design. Keep it looking fresh and easy on the eyes by keeping your content short and sweet and incorporating a prominent CTA button leading back to the registration page. Also, make sure the email template design is mobile responsive. Send the 1st invitation email introducing the event and call-to-action. Send a ‘Thank you for Registering’ triggered email to people who registered. Send a follow-up email to non-openers/people who did not click-through after 4 days including event highlights and call-to-action. Send ‘Thank you for Registering’ confirmation email to people who registered. Send a ‘Last Chance to Register’ email to non-openers/people who did not click-through after 4 days to create the sense of FOMO (Fear Of Missing Out) and a sense of urgency. Send ‘Thank you for Registering’ automated email to people who registered. 2 days before the event send ‘Reminder’ email to all contacts and include call-to-action for people who still haven’t clicked-through. The thing is, people rely on their inbox for everything today. But that also means that there are too many emails coming their way. This can sometimes get overwhelming and lead to your email getting ignored. But you can make your email stand-out and get your subscribers attention. While subject lines are the most tricky part as these make or break your emails’ chances of being opened, make sure once opened its worth the readers time and attention. Event marketing emails need to be extremely well thought out. You are inviting people to not just give attention to the email they are reading but also take out time to actually go and attend an event. Be it an online or an offline event, the success of the event lies in not how many people registered to attend but actually attended. An extremely important element that distinguishes event marketing emails from other email campaigns is timing. Know what’s the best time to send emails to your contacts and know how soon you need to start sending out the emails before the event. While for an online event you can start sending the invites 2-3 weeks prior to the event, for an offline event the very first email must be sent out at least a month prior to the day of the event. Start with going through some event marketing email examples to see what others are doing. This will help you start thinking in the right direction and inspire you to create your own emails. Plan, plan and plan some more before you get started. Event marketing emails are easy to create and easy to succeed at, but only when they are built upon a solid plan that has been well thought out and properly executed. Each element that goes into creating your emails requires your complete attention. From the first impression your subject line makes, to the excitement the content builds, and the beautiful email template designs that just compels the reader to click the link. Everything matters. You may be tempted to start sending out invites and promoting your event, but follow a well laid out plan. You want to make sure that every email you send out brings in the ‘I can’t wait for this event’ feeling. 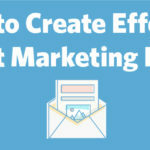 The post How to Create Effective Event Marketing Emails appeared first on Constant Contact Blogs. This entry was posted on Friday, November 2nd, 2018 at 9:37 am	and is filed under Email Marketing, Event Marketing, News & Updates. You can follow any responses to this entry through the RSS 2.0 feed. Both comments and pings are currently closed.